Cup of Lavender Tea? It’s Got 8 Benefits! Lavender tea is a refreshing, calming drink that has a vast array of healing benefits. Lavender (1) is used in food and medicine; it’s aromatic, carminative (i.e., combats gas), antispasmodic, antibacterial, antiseptic, and an expectorant. It has a long history of use, dating back to ancient Greece and Rome, and even earlier. Dioscorides, a Greek naturalist, was using lavender medicinally in the first century AD. Lavender was used in ancient Egypt as a perfume and in incense. In China lavender is used in a medicinal oil called White Flower Oil (2). Lavender has been known to ease headaches, anxiety, toothaches, sore joints, and coughs, and to calm digestive troubles. English lavender, Lavendula angustifolia, is the most widely cultivated species of lavender and the type used in most recipes. 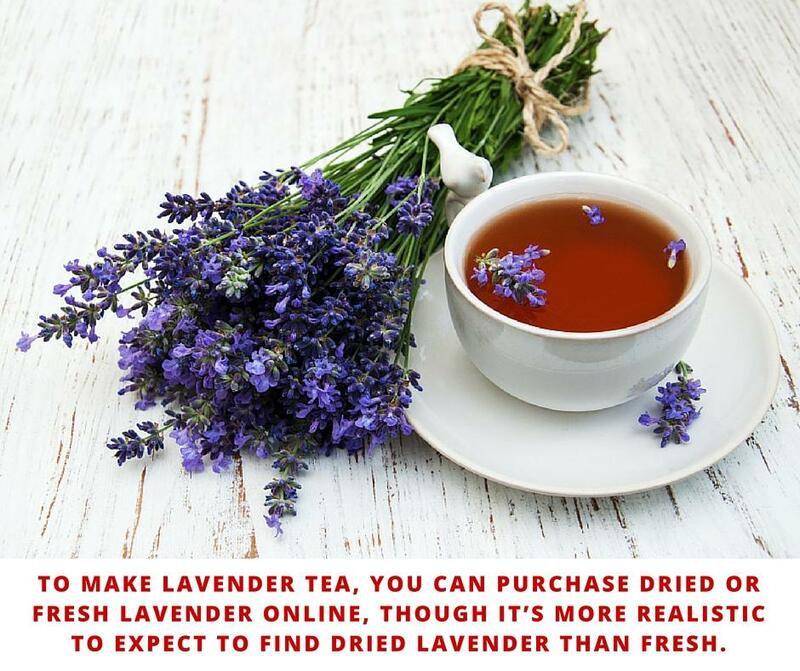 You can purchase dried and fresh lavender online, though it’s more realistic to expect to find dried lavender than fresh. Acquiring fresh lavender means going to a lavender farm, which can be found in California, Washington, and Oregon (these three states have by far the most lavender farms in the country), Colorado, Connecticut, Ohio, Michigan, and New York, among many more. There are also lavender festivals throughout the year in states that grow lavender successfully and prolifically. If your state doesn’t grow lavender, you’ll need to order online. 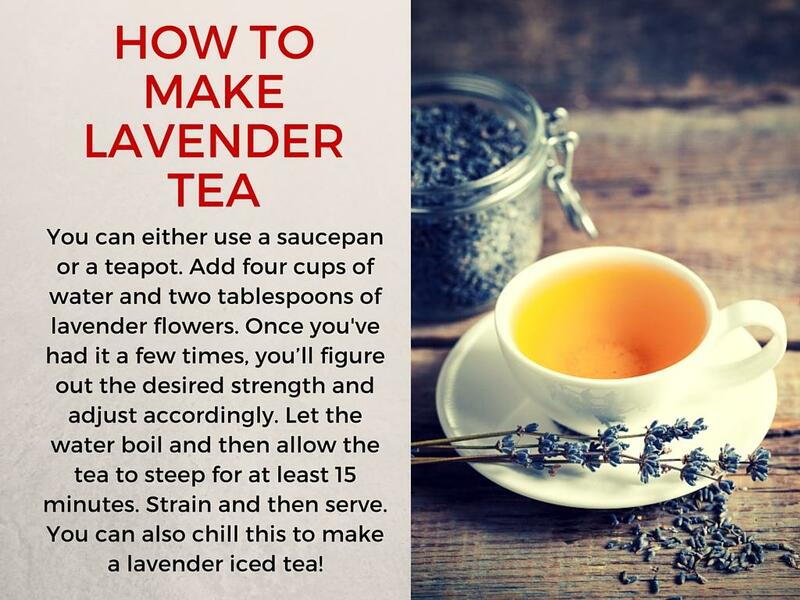 A lavender tea recipe is actually a lavender herbal tea. The use of the word tea is a loose association to what we more commonly think of as tea: the black leaf variety. A basic lavender tea recipe won’t have tea in it, but that said, there are lavender black teas available which are either infused with lavender essential oils or combined with lavender leaves. To make lavender tea, you can either use a saucepan or a teapot. Add four cups of water and two tablespoons of lavender flowers. Once you’ve had it a few times, you’ll figure out the desired strength and adjust accordingly. Let the water boil and then allow the tea to steep for at least 15 minutes. Strain and then serve. You can also chill this to make a lavender iced tea. Lavender milk tea is easy to make. You can use any black tea you have and add some fresh or dried lavender leaves to it. Prepare the tea as you normally would, then add milk or cream to taste. For an added treat, use sweetened condensed milk instead of regular milk. Heat milk on the stove in a saucepan or pot, but not to scalding. Top your lavender tea with the frothy milk and garnish with dried or fresh lavender. So you’ve got the recipes and you’d like to try this delicious drink, but what will it do for you as far as health benefits are concerned? If you get headaches or migraines, it’s a good idea to have lavender on hand in some form. Lavender calms the nervous system and slows the cardiovascular system down so it can release the constricted blood vessels that end up causing pressure in the head. Sip a cup of lavender tea and rest in a quiet place until the pain is gone. Lavender’s most common use, arguably, is as a sedative to help promote sleep. In a sleep study conducted in 2005 at Wesleyan University in Middletown (3), Connecticut, a test group that inhaled lavender in vials experienced positive changes in their sleep quality, compared to a control group that inhaled the scent of distilled water. Lavender promoted deeper sleep (4) and the test group said they felt more vigorous in the morning. Prepare a potent cup of lavender tea and enjoy the smell of it, sipping slowly so you can benefit from the scent as well as the tea itself. Having some gas issues? Bloated? Feeling nauseated? 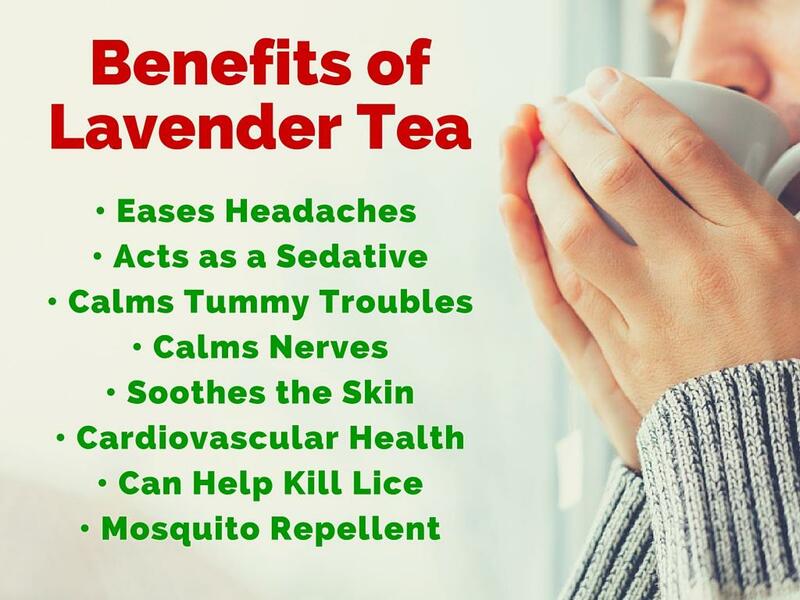 Lavender tea can help ease these symptoms. The polyphenols in lavender help prevent harmful gut bacteria from developing, which in turn will help stop creation of gas and toxic emissions from said bacteria. This eases stomach discomfort. A study published in 2016 in the Iranian Journal of Nursing and Midwifery Research (5) found that regular inhalation of lavender helped 140 women prevent stress, anxiety, and postpartum depression versus a control group that did not inhale lavender. The women were asked to inhale three drops of lavender oil every eight hours for four weeks. Herbal waters have been used for centuries in beauty regimens because they are hydrating and deliver beneficial properties of particular herbs or flowers to skin cells. Rose and lavender floral waters are two of the most popular and healing. Make a batch of potent lavender tea, allow to cool, and then add to a spray bottle. Wash your face, then mist it with the floral lavender water. Lavender improves your cardiovascular system because it’s been shown to lower blood pressure levels and improve blood circulation. If you’re on blood pressure medication, don’t stop taking it and speak with your doctor first about using lavender as an adjunct therapy. Stress impacts cardiovascular health, particularly blood pressure, so using lavender to calm the nervous system and mind should put less stress on the heart. Lice are typically an issue when you have school-aged kids at home, and if you do you’ll want to stash this tidbit away. Lavender can help kill lice, nymphs, and nits. If lice crops up in your family, consider rinsing hair with lavender tea after using conventional treatments just to have an added preventive measure treatment. You can never be too cautious when it comes to lice! Mosquitos do not like the smell of lavender! You can make a natural mosquito repellent from lavender tea. Follow the basic recipe above, but make the batch quite potent, so use four tablespoons of flowers to four cups of water. Let the concoction simmer for eight hours. Add to a spray bottle and then spray when outside as much as needed. Though herbs can be used to fortify the body and mind, as with anything they can have side effects, so caution is advised. That said, lavender is known to be a safe herb that many people can tolerate very well, though if you’re allergic to flowers, it might not be a good idea to consume the tea until you talk to your allergist or doctor. If you do decide to try it, have a small sample of tea first and then wait 48 hours to see if any side effects occur. 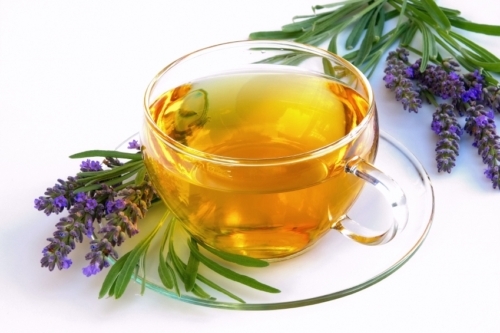 Drinking lavender tea in pregnancy should also be discussed with your doctor beforehand. If you’re thinking of bypassing the use of fresh or dried lavender flowers and want to use the easier-to-find lavender oil instead, stop right there. Taking lavender oil internally is a one-way ticket to toxicity, as the oil is far more concentrated.